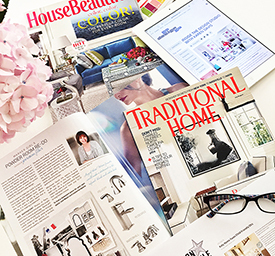 I’m sharing with you my own home makeover this year. Today it is all about the Breakfast Room. This room had to take the wear and tear of my kids but still give me a happy place we can gather. One that I would love to sit in to soak in the sunlight. Starting with the windows. My breakfast room is more of a sunroom for me. I love natural sunlight coming into my home. We have direct west sunlight in the back of the house. To some it may not be great, but to this New Orleans southern girl it is a must. We have such super-hot days here, so staying inside suits me better than an outdoor area. I opted to take advantage of the many windows facing into the space and went for “Silhouettes” from Hunter Douglas giving me privacy and still allowing me my sunny room. I then custom designed shaped cornices with my drapery workroom. Having the arches in the cornices over each window connects the window groups together. 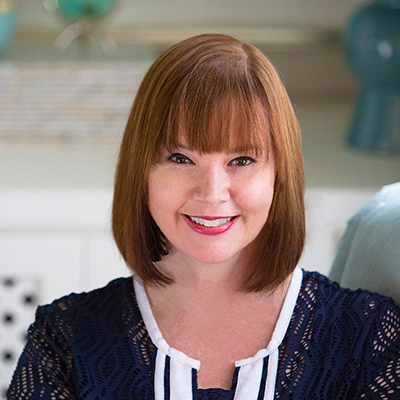 I chose this sun medallion patterned fabric from Kravet fabrics which I love, along with the blue solid borders. 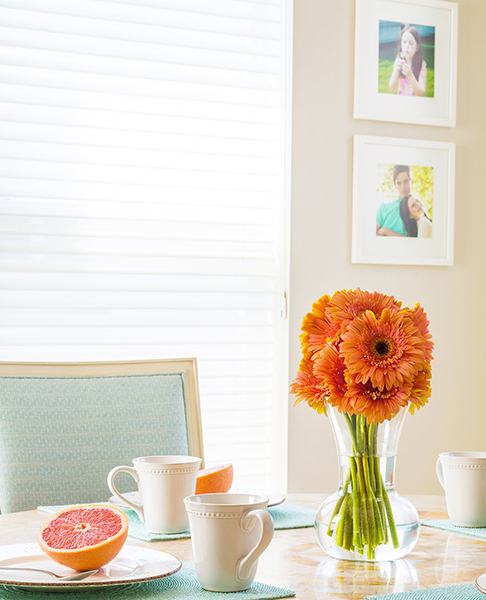 They give the breakfast room a clean, soft look. 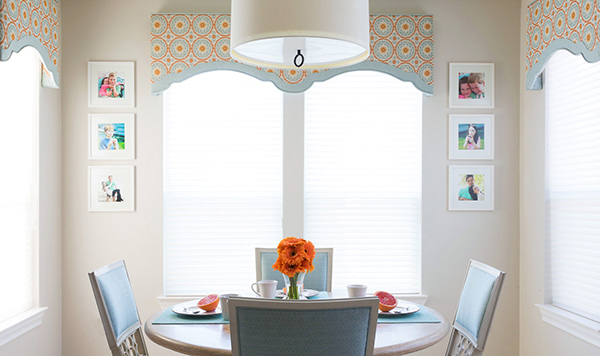 The light fixture was kept simple so as to not take away from the valances. 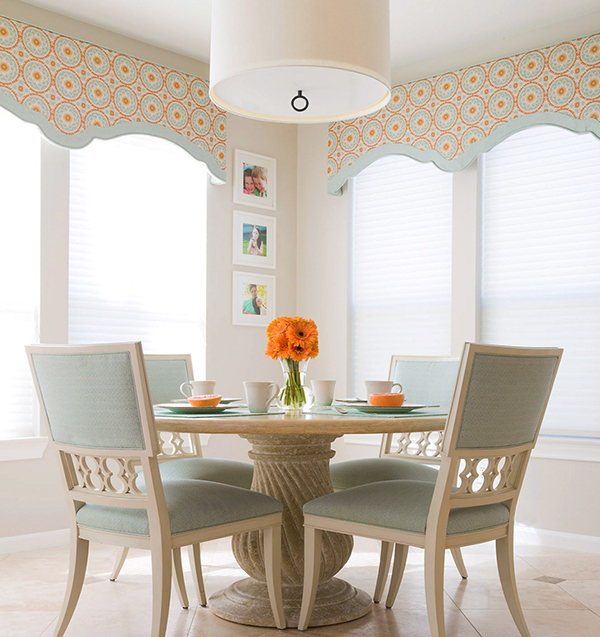 I selected a nice drum shade pendant from Jonathan Adler. The chairs were my upgrade and I had to have them. 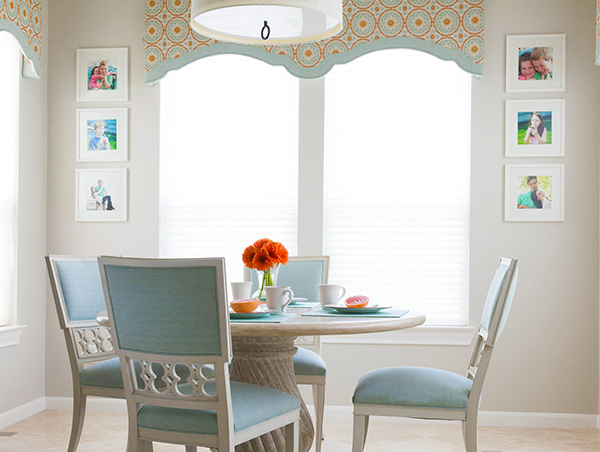 They are the Ilsa side chairs from Hickory Chair – the Alexa Hampton collection. I love the figure 8 details in them. The antiqued white finish is wonderful and works well for kids. They are covered in an indoor-outdoor fabric with a teflon finish that has helped them through many spills. The chairs are part of the same collection as my dining table in the dining room is from. I intentionally bought the group this way to be separated most of the time. And then when we have more than 6 people over when entertaining, they mix well with my dining room chairs. My table I’ve had for a while. It is super kid-friendly, and is an outdoor stone patio table. The table has sentimental value for us. It was the first thing we bought as a family with kids. It still looks good so why change it? 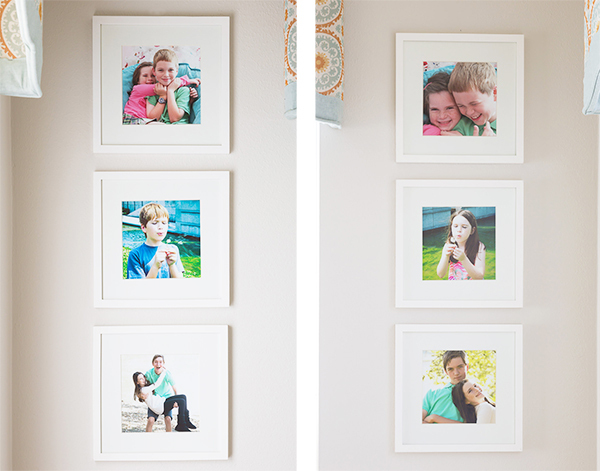 Finally, I added a personal touch with some very favorite photos of my two kids – from when they were little ones to their latest teenage photos. My husband loves to capture them being themselves on film. They are laid out simply on either side of the back window where there was some open space. We had the painter paint the West Elm frames the same color as the trim so they stood out more and provide a slight contrast to the wall color Natural Cream from Benjamin Moore. A great little happy space that holds many memories for us, gathering around working out challenges, and most importantly sharing laughter. I can’t wait to make more memories in this space.